From Indian trails to railroad tracks, and from paths beaten by horse-drawn carriages to the paved roads as we know them today, Pigeon has had quite the history! In the mid-late 1800's settlers came in droves by following the Pigeon River, which had been named several decades earlier by surveyors who found that wild pigeons, or passenger pigeons, were so numerous along the banks that the river was appropriately named the Pigeon River. The die was cast for a new village when the Saginaw Tuscola and Huron County Railroad crossed the north/south line one mile south of Berne in 1886. When the potential for growth in the Pigeon area became evident, settlers began to establish businesses and other ventures in the area such as banks, grain elevators, a grist mill, several churches, a first-class graded school, post office, two large hotels, a fine opera house, blacksmith shops, doctors, several grocery stores and more. 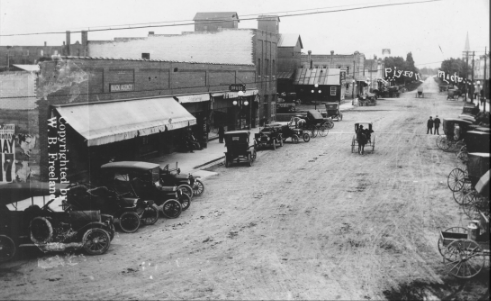 The Village of Pigeon was officially incorporated in 1903. Settlers came from many ethnic backgrounds, religious convictions, and brought with them many occupational skills. Many immigrated through Ellis Island or Baltimore and a good number began their lives in the New World in Canada. Many settlers were German, Scotch, Irish or English. German was the most common spoken language on the street for conducting business and could be read from store signs. Although Pigeon became a melting pot of settlers they helped each other- building their log cabins, raising their barns, harvesting their crops, caring for sick neighbors and delivering their babies. They were unusually happy and found many occasions to celebrate together. They navigated tragedies of fires, windstorms, epidemics, and other personal tragedies through devout hard work and resilience. Today, Pigeon is proud to possess some of these same qualities and continues to make progress as a village of people who stand together. Would you like to learn more about the Village of Pigeon's rich history? Visit the Pigeon Historical Society online or visit them on Facebook. Currently, the Village has about 1,200 residents with over 500 homes and 50+ businesses employing over 1,000 people. We have our own hospital operating under the umbrella of Scheurer Healthcare Network which includes Country Bay Village, Country Gardens Assisted Living, Scheurer Family Vision Center, Ambulance Service and Medical Clinics here and in surrounding towns. Some of our other major employers are Huron Castings, Axis Machining, Cooperative Elevator, Thumb Bank & Trust and Agri-Valley Communications which consists of Pigeon Telephone, Thumb Cellular and Agri-Valley Services. Pigeon has a lot to offer the surrounding areas for shopping. We have a full service grocery store, a hardware store, a women’s clothing store, an auto supply, a gift shop, a lumber yard, a general supply store, a veterinarian, a meat processor, a car dealership, two pharmacy’s, a flower shop, two chiropractors, two barbers, three beauty shops, three plumbers, three gas stations, four insurance offices, four banks, three assisted living centers and three restaurants. We also have a local library which serves 4 townships. As for recreation the Village of Pigeon has a beautiful park complex consisting of six ball diamonds, bandshell, two pavilions and picnic tables, playground area featuring a playscape, snow hill and a tractor pulling track. Would you like to learn more about the Village of Pigeon? Whether you're looking for a new place to put down roots or just passing through, give us a call or drop by the office and we will be more than happy to address your requests.